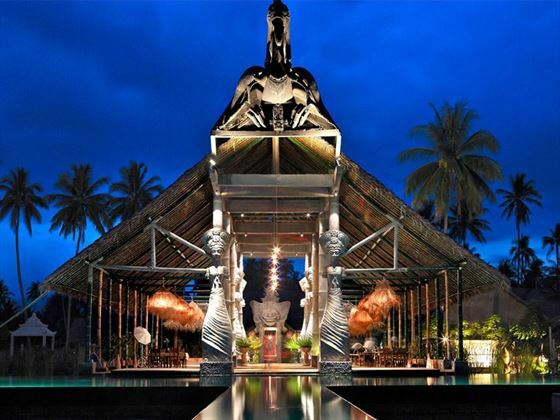 Hotel Tugu is found on the North West coast of Lombok on secluded and beautiful Sire Beach, 45 minutes’ drive from Sengiggi and surrounded by fishing villages. 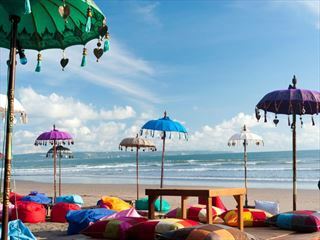 It can be reached by a 30 minute flight from Bali, followed by a 90 minute road transfer from the airport. Alternatively a ferry service departs from two different ports in Bali (Benoa or Padang Bai). Our transfer service will collect you from your hotel in Bali, take you to the ferry port for a boat transfer time of approximately two hours, followed by a road transfer of approximately 15 minutes from Teluk Kodek port to Hotel Tugu in Lombok. 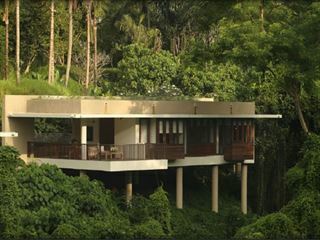 The rooms are in a serious of villas spread around the lush, tropical gardens. 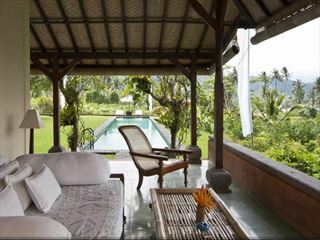 Kampong Lombok Bungalows sleep up to 3 (2 adults and 1 child) with a Queen Bed and garden views. Ampenan Bungalows sleep up to 3 (2 adults and 1 child) with a King Bed and terrace with garden views. Aloon-Aloon Garden Villas enjoy garden views with outdoor space for relaxing and dining and a copper sunken bathtub. 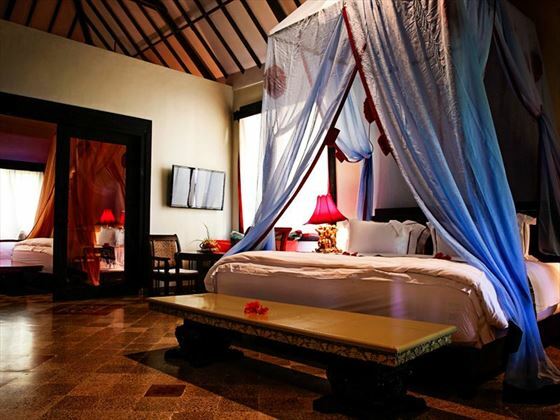 Swarga Villa is a lovely couples’ hideaway with a private terrace, outdoor dining space and semi-outdoor bathroom. 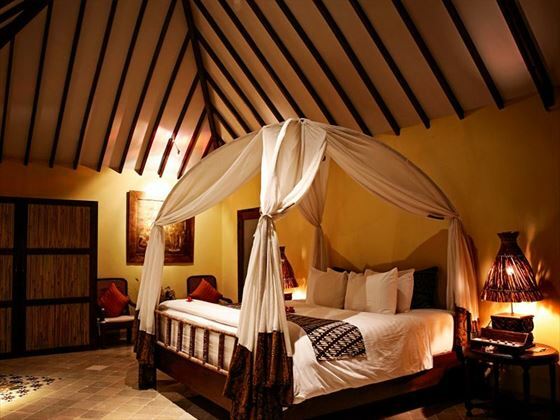 The Two-Bedroom Villas measure 120sqm and sleep up to 2 adults and 2 children. These villas feature a terrace and gardens and a semi-outdoor bathroom with large bathtub. 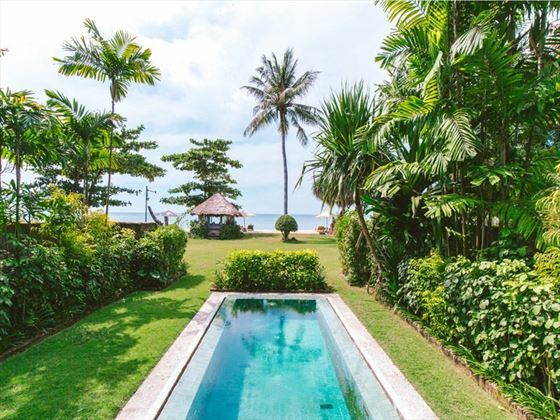 Bhagavat Gita Ocean Front Villa is big enough for families and can sleep 2 adults and 2 children with ocean views, a private plunge pool and spacious outdoor bathroom. 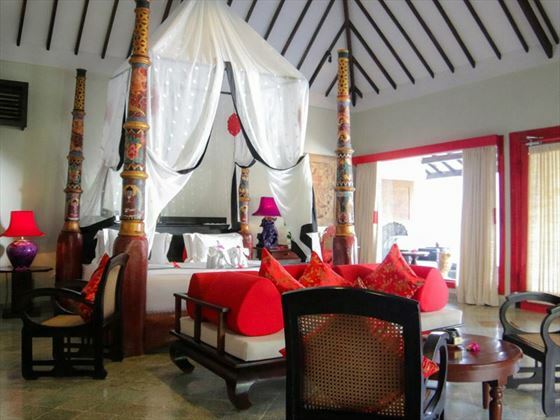 Puri Dadap Merah Villa measuring 120sqm, this is a couples’ haven is like a personal temple with private plunge pool, massage area and personal rooftop where guests can enjoy a romantic dinner under the stars. Sang Hyang Suites measure 600 sq m with a large private plunge pool. 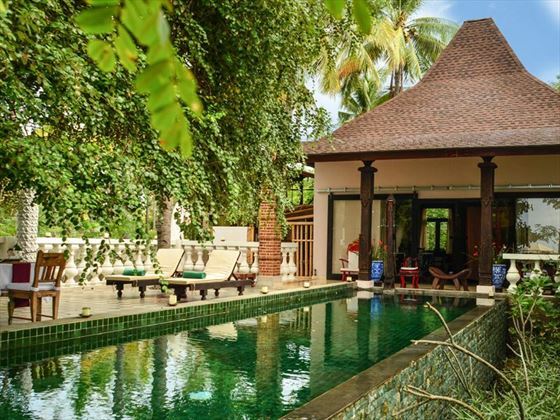 Nirvana Beachfront Villa also has a Jacuzzi and spacious terrace. Dijwo Villa is perfect for couples with a 7m private plunge pool within a private landscaped garden. 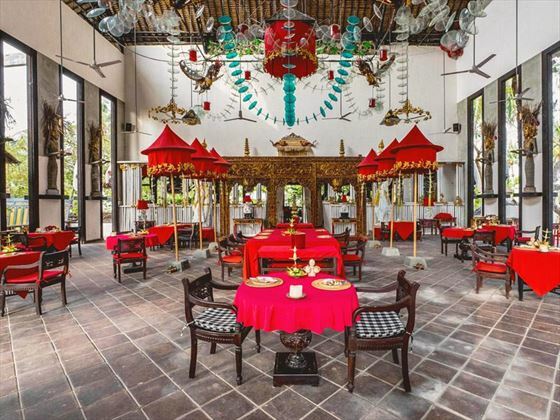 It is not just about where to dine, but how to dine at Hotel Tugu, where new experiences are encouraged through a wonderful dine anywhere concept. (Indeed you can actually have breakfast at pretty much any time you fancy in all manner of locations!). Enjoy an intimate romantic dinner with a sunset on the beach or find a candlelit nook besides a lotus pond; then the next day join a theatrical cultural evening or Indo-Dutch Rijsttafel feast. What better way to connect with Indonesian culture than through food? Kokok Pletok Restaurant The main restaurant is whimsically topped with a giant rooster and serves local and international cuisine al fresco overlooking the pool and the beach. 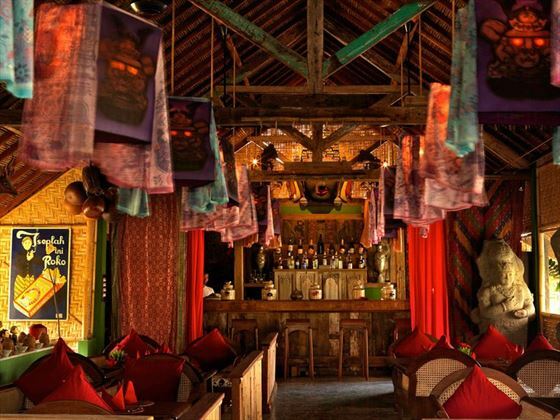 The Lara Djonggrang Bar is another option for breakfast or lunch by day and by night serves Tapas by lamp-light, plays music and offers a fabulous wine list. Set on 400m of private beach-front where white sand meets turquoise waters over coral reef, perfect for snorkelling. 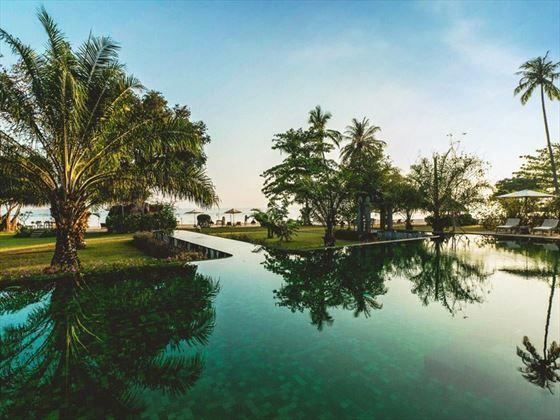 Two pools overlook the beach to maximise the views. Seafront championship golf at Kosaido Country Club is on your door step, which offers views of Mt. Rinjani and the Gili Islands. 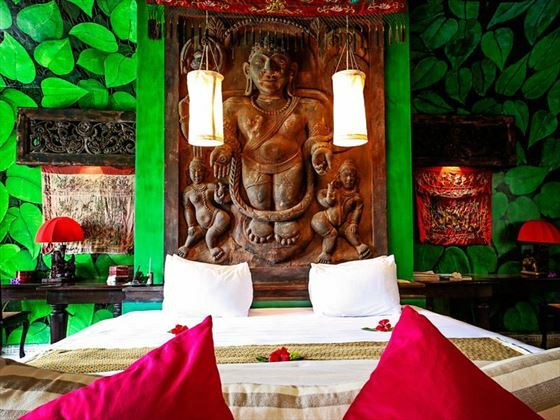 Hotel Tugu literally offers you a temple to Spa treatments - an ancient Hindu temple - adorned with artefacts dating back 100s of years with views of Mount Rinjani rising above the ocean. 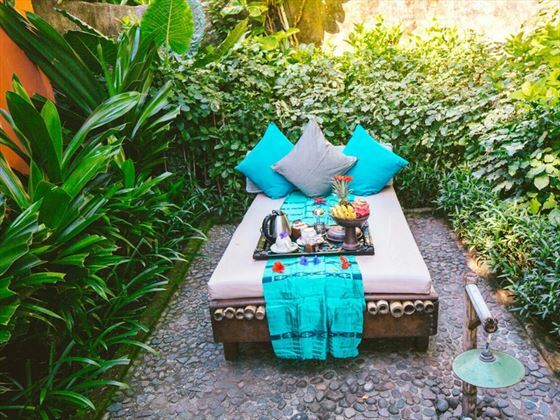 What better setting could be imagined for treating your body to a Balinese massage, or to unlock the secrets of the past with rituals unique to Hotel Tugu, reinvented and used to rejuvenate body and soul?